You've found the “U.S. Corriente Cattle Breeders” page here at Hobby Farm Wisdom! If this is the first time you have visited our site: Welcome! The Corriente cattle are a breed descended from Spanish cattle imported the United States in the 15th century. 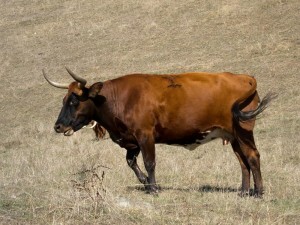 Some breeders use Corriente cattle for meat production as it producers a much leaner meat than most other cattle breeds. Today though, its primary use is as sport cattle in rodeo events. Corriente cattle are smaller than many breeds but are very athletic and easy to care for. They require little to no intervention during calving and eat significantly less than their larger counterparts. Corriente cattle have a reputation as escape artists since they can clear a standard barbed wire fence and squeeze through small openings. However, they are also excellent foragers and can thrive on an open range.